Save A Kitty has a number of special needs kitties that will remain with us due to medical or behavioral issues. Below are just a few of our special needs kitties in need of sponsorship. Select a cat to sponsor for one year or request that we assign you a cat for sponsorship. Payment can be made through monthly installments of $25 per cat or as a one-time donation of $300 per cat. You may either pay through check or via our donation page. Once your sponsorship is processed, we will mail you a Certificate of Sponsorship with a picture and short biography of the sponsored cat(s). You will also be provided updates on your sponsored cats, and opportunities to visit the cat(s) at our sanctuary. 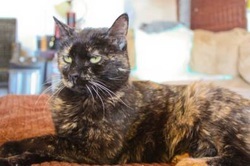 Appointments to visit a sponsored cat may be scheduled by contacting Debbie at (818) 825-3096. Sponsors will be notified in the event that their sponsored cat has passed onto the Rainbow Bridge and will be provided with an option to continue the term of their sponsorship with a new cat of their choosing. Taz is a 10-year-old boy. He was 6 months old when we took him in and he was named after the “Tasmanian Devil”. He had been rescued by a person who had left him in a cage, fed him, and cleaned up after him, but never spent any time trying to socialize him. After having been kept in a cage for four months, this “rescue person” was going to release him back onto the streets. We intervened and took him into our rescue. Now, after many, many years, he is a sweet boy and has the most beautiful green eyes on the planet. Pumpkin is one of our senior kitties. She is 18 years of age. Aside from being slightly arthritic, she is doing very well. Her people moved away and simply left her behind. That was over 12 years ago, and she has been with us ever since. Prince is a beautiful 8-year-old rag doll. 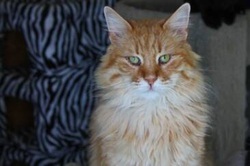 He was trapped as a kitten at a Canoga Park garden center. Prince is a very shy cat and never showed well. Consequently, he was never adopted. Subsequently, he developed a chronic urinary tract problem, which requires special diet and a stress-free environment. Consequently, we feel it is in his best interest to remain with us. Ava is approximately 7 years of age. She is a severely cross-eyed kitty with limited vision. She was rescued from a subterranean parking lot in Tarzana where she had been bullied and terrorized by an existing colony of cats. She was starving and malnourished when we took her in and her eyelids were virtually sealed shut, which caused blindness. Eyelid surgery has restored partial vision. She is now quite content and safe in her home here at Save A Kitty. Nemo is about 10 years of age. He is very unpredictable. At times, he is an angel but at other times he can suddenly become extremely aggressive, which in turns makes him un-adoptable. He was about 7 months of age when we first took him in. 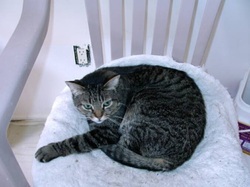 From what we can ascertain, he had once been adopted and was not allowed to be on the furniture and was continually kicked by the “man of the house”, which would explain his mistrust at times. 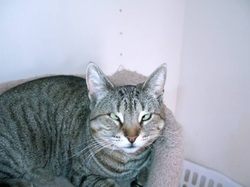 Legolas is a very sweet 3-year-old boy named for his elfish and etherial look. At 5 months of age, he was diagnosed with asthma. He is doing well and as you can see, he has grown into a beautiful big boy but we have to watch him very carefully. The last couple of years have been very challenging for most charities. Funding and grant money have been affected by our economy. Without the generosity of our supporters, we would have been unable to save as many lives as we have.